Locked for now. I do not like my patch note being made a place to post spam. The event was reset on August 28, 2016 @ 6:18 a.m. Please do a check file or re-patch if you still could not do the event after the reset. Please feel free to continue posting on here. But no spam of any sort, please and thanks. LV100 Change: Add +30 Mileage Points to the reward. LV130 Change: Lower to LV120 > Switch Fast Track Box to Panda Set 120(Power/Magic/Charm/Sense) No Vest. LV150 Change: Lower to LV140 > Switch Dino T-Shirt to Dino Set 140(Power/Magic/Charm/Sense) No Vest. LV200 Change: Change 200 Mileage Points to 90 Mileage Points. Move Pet EGGS to the Carved Wooden Boxes. ^^For the above statement, please refer to the Panda Set and Dino Set being given through Level Rewards. Add Character Fashion sets. (As a box, when opened giving the whole set) Price : 100 eggs. From the Recycling Shop the player can buy a "100 MS Point Ticket" for 75 Recycling Tickets. At this point the player can log-in to the Website and from here they could go to Manage Account > Events and click on this link. From this point the user is allowed to exchange all of his/her MS tickets for the MS value they are worth. 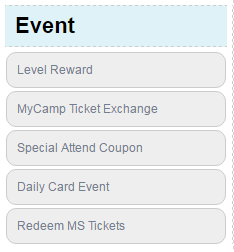 **The MS Tickets SHOULD be tradeable in-game and they should stack in the ETC Tab. These are some ideas I've had of late, and had not posted due to the thread being locked. Now that the thread is unlocked I hope that the GMs can see this! I think the vest reward needs to be maintained as non donators desperately need an inner. My suggestion is to make missing jp stones like 185, 290, 380 variants. Based on calculations the stat range of jp stones are magic stone min*1.2 and magic stone max*1.35. I can provide a table if necessary. 1) Custom Fashion is difficult to do - so far as I've looked into it, fashion items are just palette swaps of the normal clothes, and to save internal space the game just says "if wearing this item, apply this palette to these items"
3) Moderator edits leave a mark on the post and prevent further editing of the post by the poster. Petunia's post is at the end of page 5 still, and is unchanged. The post this was replying to was removed, rendering it nonsensical. Edited by pokota, 03 May 2016 - 03:54 AM. Did anyone notice the back profile of janus wing is put as the front profile for the character. It doesn't work for me and I tried to repatch 4 times, it doesn't even download any file. Please, would it be possible to add teleport option from B3 Cage 1 to B4? Edited by hovado, 03 May 2016 - 02:54 PM. I patched my client many times to no avail. For the Event, I have 2 extra Gm Wan tickets of gratitude and 0 Louis Bitton's special exchange ticket. What can I do with the extra 2? Is it supposed to be 20 more Louis Bitton's special exchange tickets?? ?